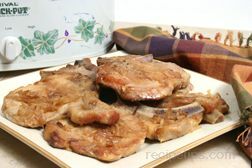 Frying is a dry heat cooking method, which is a quick and simple way of cooking pork. 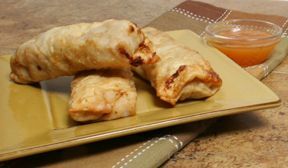 It can be accomplished by the use of two different methods, pan-frying and deep frying. 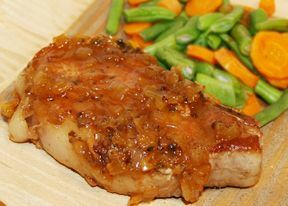 Both methods work on the principle of using hot oil to cook the meat, producing cuts of pork with a crispy brown outside and juicy, flavorful meat inside. 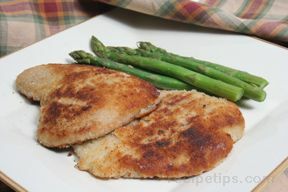 The meat is often coated with a thin layer of flour, bread crumbs or batter. 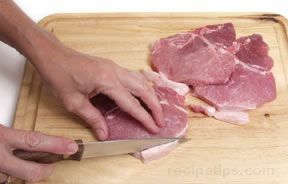 Smaller cuts of pork are generally used for frying rather than larger cuts, such as roasts and hams. 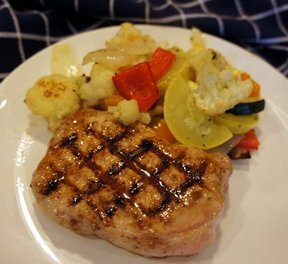 The best choice of pork cuts for frying are chops, steaks, ham slices, Canadian bacon, bacon, sausage, and ground pork. 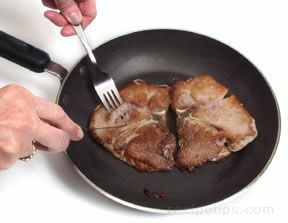 Pan-Frying: When pan-frying pork, use a heavy skillet with deep sides. 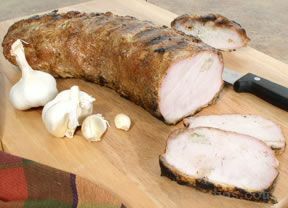 The cuts of pork can be prepared by simply sprinkling with salt and pepper, marinating, or coating with your favorite seasonings to create a desired flavor. 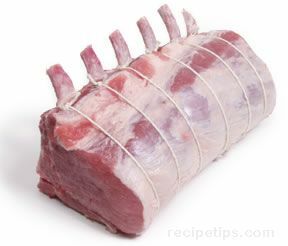 Excess fat should be trimmed and the pieces dried off with a paper towel before frying. 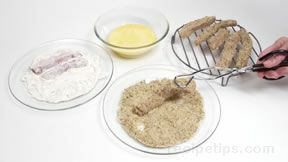 If pieces are coated with flour or bread crumbs, they should be placed on a rack and allowed to dry. This may require 20 to 30 minutes. Allowing the pieces to dry will provide for even browning of the meat when frying. To begin, trim off excess fat. 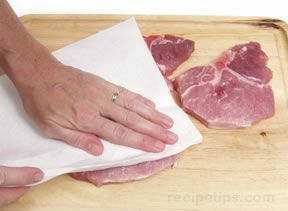 Thoroughly dry the meat by patting with a paper towel to ensure even browning. 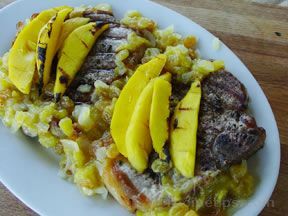 Heat 3 or 4 tablespoons of oil (the amount will vary depending on the recipe and the cut being fried) in a heavy skillet using medium-high heat until the oil is very hot but do not let it start browning. The oil should be heated to a temperature high enough so that when the meat is added it will sizzle. 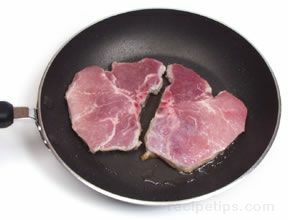 Pork pieces should be placed in a single layer in the heated skillet. Allow enough space between pieces so that they are not crowded, and can be cooked and browned more evenly. Continue to cook, uncovered, over a medium-high heat, turning when the first side is golden brown and frying the second side until it is nicely browned. The amount of time required for cooking will depend on the thickness of the cut. The meat should be slightly firm to the touch when it is done. 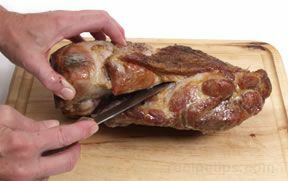 Check for doneness by cutting a small slice in the piece and check to see that the meat is opaque in appearance inside and that the juices run clear. 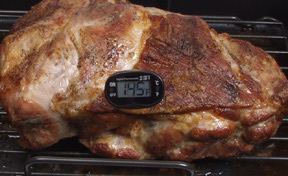 If the cut is thick enough, check the temperature of the meat with a thermometer to be sure it is at least at 145°F. Bacon: When frying bacon, place the strips into a heavy frying pan that has not been preheated or had oil added. Fry the bacon over medium low heat. The amount of cooking time will depend on the thickness of the slices and desired doneness, but will generally vary from 7 to 12 minutes. Place the bacon in an unheated pan. Cook over medium low heat. Cook until bacon is golden brown. Turn occasionally while cooking. 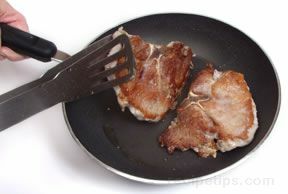 When cooked to the desired doneness, remove from the pan and place bacon on a paper towel to allow the grease to drain. Ground Pork: Frying ground pork generally does not require the addition of oil unless the meat does not contain sufficient natural fat. Ground pork can also be made into patties and then fried. The meat is done when all the pieces are lightly browned or the patties are browned on the outside and no longer pink in the center. The excess fat should be drained off before serving. Ground pork is fried over medium heat, and should be stirred and crumbled into pieces as it cooks. Ground pork is done when all the crumbled pieces lose their pinkish color and they are nicely browned. Ground pork can also be made into patties. To fry, place them in an unheated frying pan. 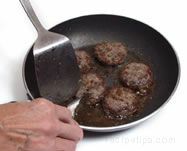 Patties should not be crowded in the pan to allow even cooking and browning. Cook over medium heat until nicely browned on both sides. The patties are done when they are browned on the outside and no longer pink in the center. Sausages: Pork sausages can also be cooked using the pan-frying method. 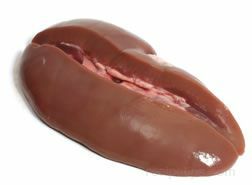 If they are precooked sausages, they can be placed in an unheated frying pan and cooked until nicely browned and heated to an internal temperature of 140°F. Place sausages in an unheated frying pan. Add a small amount of oil or pierce the casing of the sausage to allow the sausages to release some of their own fat while they are cooking. Fry sausages on medium low heat until all sides are evenly browned. 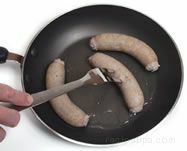 If sausages were not pierced when cooking began, pierce the casing while frying to prevent casings from splitting open. 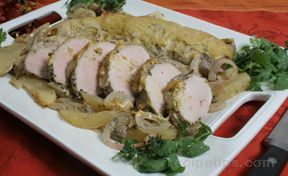 If they are fresh sausages, it is best to poach them for a few minutes before frying to ensure that they will get fully cooked without the outer layer becoming over done. Once they have been poached, fry them in the same manner as the precooked sausages. Do not pierce the sausages until after they have been poached and are in the frying pan, otherwise too much of the fat may escape while poaching, causing the sausages to be dry. 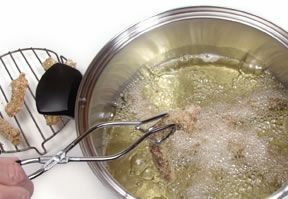 Deep Frying: When meat is deep fried, it is cooked by the transfer of heat from the oil used in deep frying and not directly from a heat source. 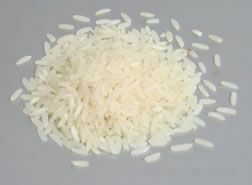 Generally the cuts that are best for deep frying are smaller sized boneless cuts, such as cubes, strips and cutlets. 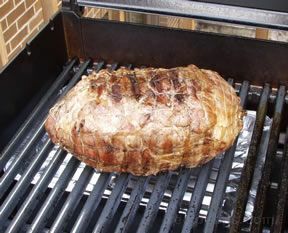 Deep frying larger cuts make it more difficult to produce a cooked piece of meat that is properly done in the middle and not over done on the outside. 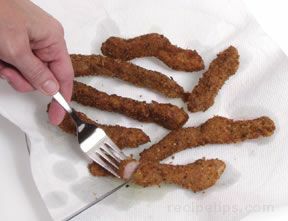 Often pieces that are deep fried have a crumb coating or a batter applied to them before frying, to add flavor and provide a crispy outside coating. When a crumb coating is used, the pieces of meat are dredged in flour, dipped in egg and then coated with bread or cracker crumbs. They are then set aside to dry for 20 to 30 minutes before frying. If coating with a batter, the pieces can be coated just before frying but be sure excess batter is allowed to drip off before placing the meat in the hot oil. 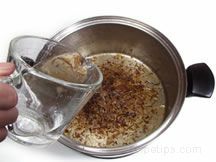 To fry, fill a deep pan or an electric deep-fat fryer with enough oil so that the cuts you are cooking can be completely submerged in the oil. 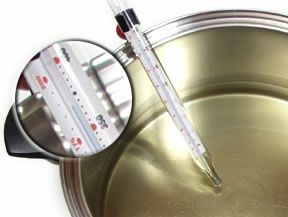 Heat the oil to between 350°F and 375°F. To check the temperature use a deep-fry thermometer, or if you don't have one, a candy thermometer will also work. 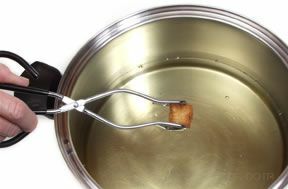 If you do not have either thermometer, you can test the temperature by dropping a cube of bread into the hot oil, it should brown in 50 seconds if the oil is about 365°F. Using tongs or a metal spatula, place a few pieces of pork into the hot oil, being careful to not overcrowd them. Cook until golden brown. Cooking time will vary depending on the size of the cuts being cooked. As the pieces get done, remove them from the oil and place on a paper towel to allow the grease to drain. Check for doneness by cutting a small slice in one of the pieces. The meat inside should be opaque in appearance. Frying at the high temperature used in deep frying may result in the meat having a tint of pink coloring in the middle, but it is safe to eat if its internal temperature is 145°F. If not fried quickly, the meat will have a tendency to become tough. 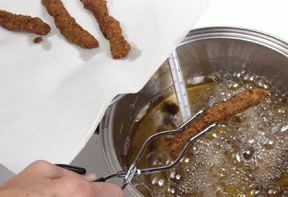 With either method of frying, an important part of the process is keeping the oil at the proper temperature. Once the meat is placed in the hot oil the temperature of the oil will drop. But, if the oil continues to bubble consistently, it will cook the pork properly. 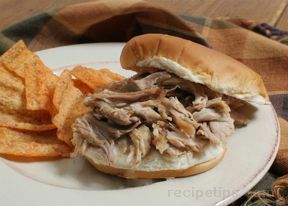 If the temperature of the oil becomes too hot, the outside of the pork cut burns before the inside is done. To prevent this from happening, the temperature may need to be turned down a little once the meat starts browning, but not too much or the meat will be greasy. Controlling the temperature of the oil is an important part of producing delicious fried pork cuts. 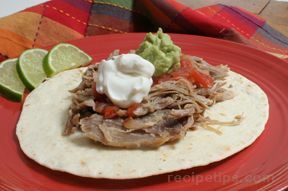 Shown below are some additional tips on frying pork. When pan-frying, the best cuts to use are boneless. Boneless cuts will lay flat on the bottom of the pan and allow the meat to cook more evenly. When the bone is left in the chop or steak, the meat around it cooks slower. 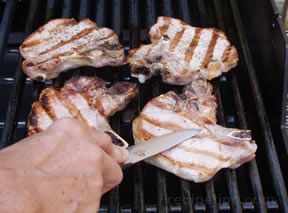 Frequently, when trying to thoroughly cook the meat around the bone, the outer edges will become over done. Use tongs or a spatula instead of a fork when placing pieces in the pan or when turning. Piercing meat with a fork allows juices to escape. 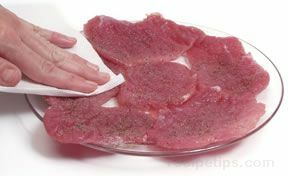 To help reduce splattering when frying, dry all meat with a paper towel before placing in the hot oil and if the meat has a crumb coating, let the meat stand for 20 to 30 minutes before frying. Be sure all utensils and equipment are dry before they come in contact with the oil. Water will make the oil splatter when it is heated. Using canola oil provides a milder taste and it contains healthier amounts of saturated and polyunsaturated fats. 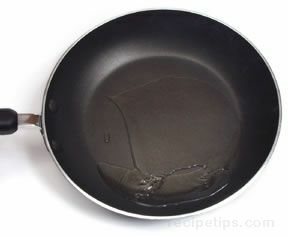 If using butter when pan-frying, mix equal portions of butter and oil to help prevent butter from burning. 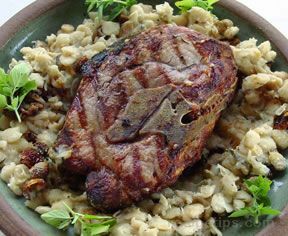 When pan-frying chops or steaks, dredging with a light coat of flour will assist in providing a nicely browned coating on the meat and create extra brown pieces on the bottom of the pan to aid in making a flavorful sauce.